ATLANTA -- The race for mayor in Atlanta early Wednesday was too close to call, with one candidate declaring herself the city's new leader and the other vowing to request a recount. 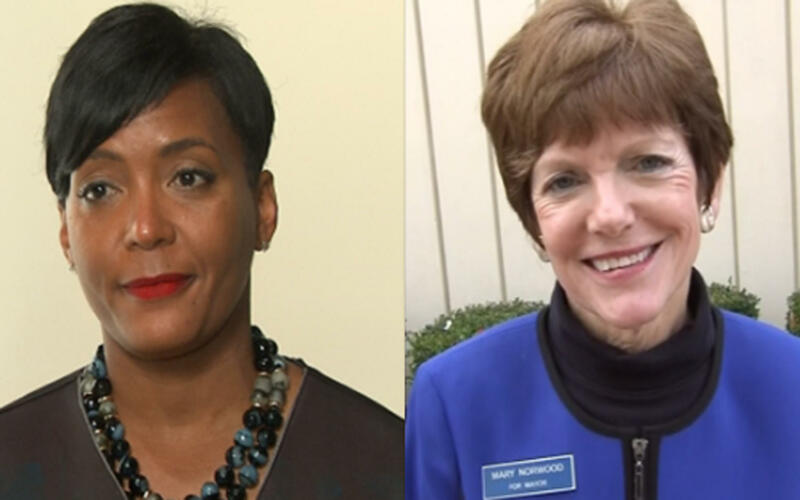 The margin was razor-thin, with several hundred votes separating Keisha Lance Bottoms and Mary Norwood. Bottoms spoke early Wednesday at an Atlanta hotel, saying near the end of her speech that she is "just in awe of what God is able to do." "I'm so honored to be your 60th mayor," she told her cheering supporters. "We will be asking for a recount," Norwood said. With all precincts reporting, Bottoms lead by just over 700 votes, reports CBS Atlanta affiliate WGCL-TV. Both women are Atlanta city council members. Norwood calls herself an independent and Bottoms is the chosen successor of outgoing Mayor Kasim Reed. A win for Norwood, 65, would give Atlanta its first-ever white female mayor, and end the Democratic Party's hold on an office it has held without interruption since 1879. Political analysts have said African-American voters will ultimately determine the outcome, but many of the city's most formidable challenges transcend race. Everyone seems to care about transportation, public safety and affordable housing. As rents and home prices soar, some longtime residents struggle to stay in their neighborhoods, and face no easy commutes if they move out. "We're behind the times in terms of having a modern transportation system compared to what you see in New York or Washington," said Kendra A. King Momon, professor of politics at Oglethorpe University in Atlanta. "It impacts quality of life because most of us don't know what we're going to run into when we head into the city," she said of Atlanta's notorious traffic jams. "That's a huge issue that we have to address." A big question is whether an ongoing federal probe of corruption in city contracting under Reed's watch will encourage voters to take a fresh look at Norwood, despite fears that as an independent who lives in the upscale Buckhead area of the city, she'll turn out to be a stealth Republican who will serve up City Hall to Georgia's deep-red political apparatus. "Just listening to Keisha and comparing what she said to the words of Ms. Norwood, I felt like she shared my values more," said Barbara McFarlin, a 50-year-old black woman who lives in the southwest Atlanta district Bottoms has represented on the city council. James Parson, a 49-year-old black man who also lives in Bottoms' district, said he's been friends with Norwood for three decades and appreciates how she's made herself available to constituents all over the city as an at-large council member. "I love that Mary is connected to most of the communities in Atlanta, if not all of them," he said. "She's approachable. She has been here. She's no Johnny-come-lately." Atlanta's last white mayor, Sam Massell, left office in 1974 and was succeeded by five African-American mayors in the next four decades: Jackson, Andrew Young, Bill Campbell, Shirley Franklin and Reed. Regardless of who wins, Atlanta will have its second female mayor, following Franklin who left office in 2010. "Kasim seemed to be more about what's best for Kasim than what's best for the city," Brower said.